I agree on Love and Parsons, but CP3 is getting friggin 160 million...??? He’s gonna be a 38 year old pg at the end of that contract...??? No one else would have given him that much!! cowens/oldschool wrote: I agree on Love and Parsons, but CP3 is getting friggin 160 million...??? He’s gonna be a 38 year old pg at the end of that contract...??? It is a ton of money for a 33 year old PG that appears to be in physical decline. He has played 18 games and his shooting numbers are down. Houston is strapped with the Harden and Paul contracts. They screwed up their team and have no place to go but down. Wonder if or when Melo will find a new home. Sacto was up 40-9 in Phoenix. A very winnable game for the Suns and they stunk it up. Doncic is the real deal and only 19. Larry was what, a 23 year old rookie when he made a similar impact? Right Larry played an extra year of college ball. Doncic is the real deal, Dallas has some real good pieces. I never like to compare the latest flash in the pan to the iconic all time greats, but McHale and IT going gaga comparing Doncic to Larry Legend....Cuban has new building block to carry franchise for years. Atlanta muffed this pick big time. He might be the first player with a game worthy of comparisons to Larry Lgend ever....McHale keeps on gushing about the kid on NBA TV and he’s 19 WTF....???? cowens/oldschool wrote: He might be the first player with a game worthy of comparisons to Larry Lgend ever....McHale keeps on gushing about the kid on NBA TV and he’s 19 WTF....???? I guess people sort of forget just how good Larry Bird was. Doncic is oozing with talent but I think he has a ways to go before I can compare him to Larry Bird. Call me after he can perform consistently at that level over a number of seasons, and leads his team to a championship. If Luka is as good at 23 years old as Larry was, that'll be in 4 years, we'll have plenty to talk about. I usually don’t watch college hoop at all until March Madness. With all the hype about Duke possibly having the first three players selected in the next NBA draft I’m tuning in to Duke vs Hartford tonight. Have to see these players in action. Even though I don’t follow college ball, my first take is Duke will beat Hartford by at least 20. Since Bird retired, don’t remember any player being compared to him, he was that good/unique/special. A lot of Magic clones and MJ comparisons with Kobe then Lebron. Paul Milsap broke a toe last night. As Woj also notes, getting this deal done by 6 p.m. Friday allows the players in the deal to be eligible to be aggregated on the Feb. 7 trade deadline. The Cavs are taking on some significant salaries as part of their recent draft capital purge; according to Spotrac, Dellavedova is due a total of $20 million over this season and next, while Henson is due $18 million. This deal could have long-term implications on the current hierarchy of power in the Eastern Conference, which sees the Raptors boasting the NBA's best record but the Boston Celtics, a preseason Finals favorite, finally building steam after a sluggish 10-10 start. Hill, 32, is averaging 10.8 points and shooting 46 percent on three-pointers this season, but he's also missed 11 games so far with a shoulder injury. He's only guaranteed $1 million of his $19 million base salary next year. 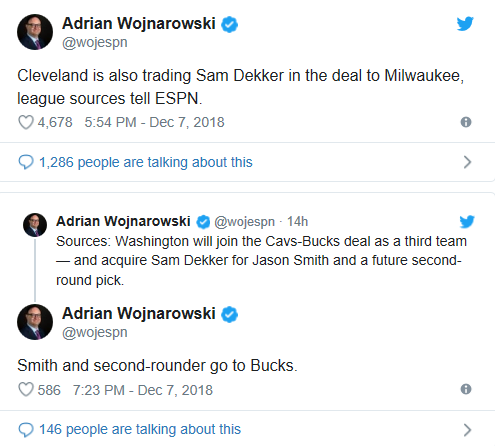 That could save the Bucks significant money if they don't resign him, freeing then up to potentially secure deals with other players set for free agency this summer, including Eric Bledsoe, Khris Middleton and former Rookie of the Year Malcolm Brogdon. not sure where the draft picks came of went to. A salary dump for Washington. Cleveland tanking as hard as they can short of shooting their own players. Bucks trying to provide themselves with depth for a deep playoff run. This is how I see these recent trades. 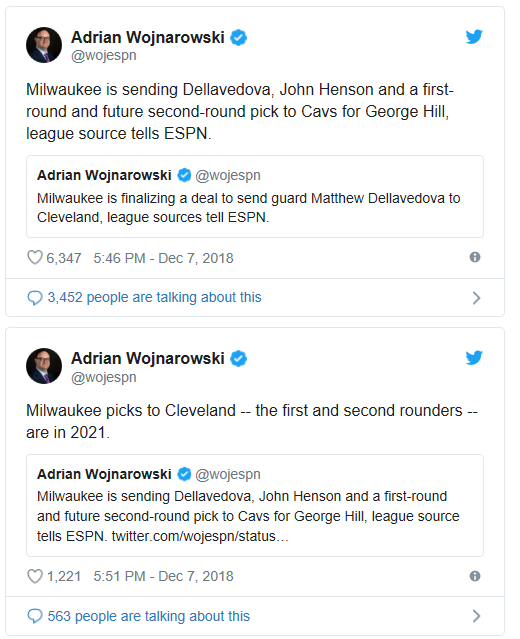 A lot of movement for Milwaukee considering they are a good team already. Philadelphia 76ers center Joel Embiid was held out of their game against the Detroit Pistons on Friday night so that he could rest. Yet he said he isn’t tired, and is feeling fine. He is, though, frustrated. He doesn’t think he’s being used right since the 76ers acquired Jimmy Butler last month. “I haven’t been myself lately,” Embiid told the Philadelphia Inquirer on Friday. “I think it’s mainly because of the way I’ve been used, which is I’m being used as a spacer, I guess, a stretch five, which (is why) I’m only shooting (29) percent (from the 3-point line). After looking at how Embiid played on Wednesday, it makes sense that coach Brett Brown would give him a break to reset. Embiid shot just 5-of-17 in the 76ers 113-102 loss to the Toronto Raptors on Wednesday, and has shot a combined 14-of-42 in their past three games. Those numbers fall well below his season average of 26.3 points per game, in which he’s shot 46.2 percent from the field. The issue for Embiid now with Butler on the roster is that he’s having to play on the perimeter more, and said it’s been “an adjustment” having to spend more time out there than he’s used to. Having to play with Butler, who loves to attack the rim, has been a challenge for Embiid offensively, too. Embiid has had to make sure to create space for Butler down low when he drives to the rim, something he’s clearly not quite used to yet. Brown, though, doesn’t think that it’s Butler’s fault. He wants his team to spread the floor better as a whole anyways, and said he thinks having Butler and Embiid working together can improve that in the long run. They just have to figure out how to get on the same page. “I don’t want to connect those dots,” Brown told the Philadelphia Inquirer. “But I think in general we all have to do better at creating space for Joel. MY NOTE: He might not understand it, but they're winning. It is hard to use Joel in a stretch 5 situation because he is not a very good shooter from the perimeter. I am sure they will work things out. A lot of talent in Philly. Doncic put the hammer down on Houston tonight. Dallas down by 8 with 3 minutes left. Doncic hits a 3 pointer, then another 3 pointer, drives for a 2 pointer floater, hits another 3 to complete a 11-0 run and take the lead from Houston. One bad dude. He was under pressure on each shot. Last 3 minutes only Harden touched the ball for Houston, ugly offense. Dallas won. Incredible. He is not Larry yet by any stretch, but he is hands down best rookie. Larry completely changed the team to a contender pretty much his first year. The defense Larry went against was quite a bit more physical than the powder puff defense they play now days.